What is language used for? 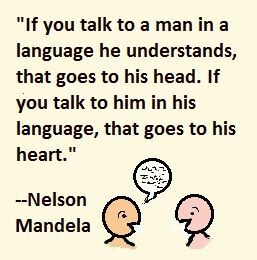 Think of the many aspects of language: an expression of culture and identity, a set of sounds and symbols, a way to communicate meaning, a way to connect with people. She talks about the value of children being able to understand the language of their grandparents, so they can learn from them. She also mentions the tragedy of languages disappearing, along with the cultural knowledge they express. Then listen to a Voice of America English pronunciation lesson on the stresses and rhythms that help make thoughts clear. It describes the way English speakers divide sentences into thought groups and stress (emphasize) certain syllables. Pauses, stress, and tone help make speech easier to understand. They also express feelings and attitudes. To practice, try tracking Patricia Ryan’s short TED talk after listening to it once. (I tried it. It’s not too hard…) You could also track a VOA Learning English or news recording. If you like to sing, find a song in English and sing along. Review vocabulary: clause, guidelines, prohibited, sole, stress. Clauses are thought groups, so we naturally pause at the end of each of them. In the preceding sentence, we would probably stress (emphasize) ‘stress,’ ‘important,’ ‘nouns,’ ‘verbs,’ ‘adjectives,’ ‘important,’ and ‘meaning.’ However, if we were comparing English with other languages, ‘English’ would get the heaviest stress.) ‘The,’ ‘a’ or ‘an,’ are usually unstressed. Click here for some background on Nelson Mandela. A note if you get gmail: Have you missed any issues of English Detective? If you find English Detective in your Promotions box, you can move it to your Primary box (if you want) by clicking on it and dragging it there. Then click Yes when asked if you want to always get it in the Primary box.